The last recording I made of Rádio Nacional da Amazônia, extracted from a 60-41 meter band spectrum recording captured in September 2016. As reported previously on this blog, Rádio Nacional da Amazônia went silent on shortwave in March due to electricity supply issues. The station hasn't been heard since (at the time of writing, a quick YouTube search for 6180 kHz or 11780 kHz does not return any matching reception videos newer than March 2017). Recently I came across two online articles from Brazil that help to clarify the ongoing situation. I have used Google Translate to reproduce parts of both below (and tidied up the translations manually in a few places to improve legibility). In short, after a widespread regional outcry, EBC (the broadcaster currently using Rádio Nacional da Amazônia's transmitter facilities) has until December to reinstate the full service to avoid losing its shortwave broadcasting license. 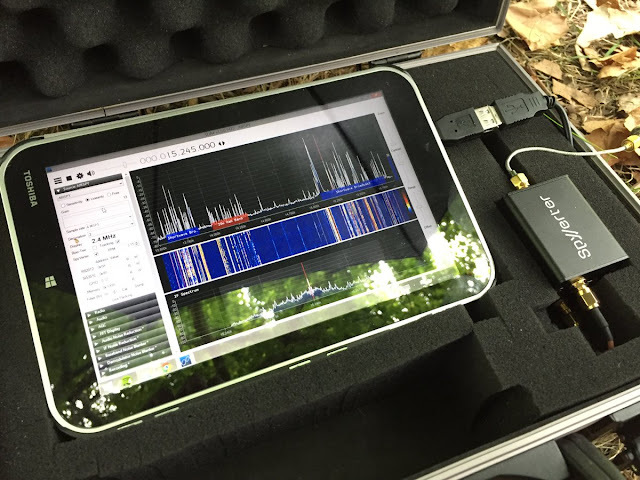 Rádio Nacional da Amazônia has been suffering from maintenance problems for many years, mainly with their short-wave transmitters on the frequencies of 6180 and 11780 kHz, on 49 and 25 meter bands, respectively. The full 250 kW capacity of each channel was already reduced to 180 kW a long time ago. Often, one channel would be off the air, but at least the other one was in operation. However, the situation has never been as serious as it is now. On March 20 of this year, more than five months ago, a lightning struck the substation that supplies electricity to Rodeador Park, 50 kilometers from the center of Brasília, where the antennas are located in the North Region of the country. So far, no practical action has been taken to repair the damage. The transmission has since been maintained only on the internet and via satellite, for those who own a satellite dish. But the people in the heart of the Amazon [listen] via old battery radios. The listeners, feeling abandoned, started complaining on live shows over the phone. In May, a statement of repudiation of the deactivation of the station was sent by 15 riverine and indigenous leaderships to the EBC directorate, with copies to the Social Communication Secretariat of the Presidency of the Republic and to the radio team. However, EBC's direction remains mute on the subject. Rádio Nacional da Amazônia has been completely off the air and Rádio Nacional de Brasilia (AM) does not have sufficient power to reach states beyond the Federal District during the night. The accident completely altered the routine of thousands of people from the Amazon, who have since contacted EBC, pleading for the return of the only station that can be tuned into where they live. This does not happen by chance. Since its creation, Rádio Nacional da Amazônia has played a fundamental role in guaranteeing citizenship to the inhabitants of the northern region of the country, through access to information. But this feeling of belonging is lost every time an Amazonian tries to tune into the station and is faced with the inhuman silence coming from their radio device. Isolated communities in rural, riverside, indigenous and border areas, located in places where access to the Internet and other communication channels is difficult, are the ones that benefit most from the public information services carried by the station, which broadcasts to such communities, in addition to information, tips on how to seek solutions to basic health problems, domestic violence and how to take documents. It is also through the radio that the listeners communicate with relatives, pass and return messages and reunite with missing relatives and friends. It is no wonder that the station has earned the folklore nickname "Amazon's payphone." Historical programs like “Eu de Cá, Você de Lá”; "Frankly speaking"; "Meeting point"; "Live nature"; "Viva Maria"; "Our land"; "Brazilian Amazonia"; "National Evening"; "Mosaic"; "Em Conta" and "Amazon Reporter" simply stopped reaching their audience, cutting off a decades-long relationship with the forest peoples. Not only does [the station] violate the right to information of thousands of people living in the Brazilian states that make up the Legal Amazon (Amazonas, Acre, Amapá, Maranhão, Mato Grosso, Rondônia, Pará, Roraima and Tocantins), [they run] the risk of losing the radio license. This is because the sole paragraph of Article 55 of Decree 52795/1963 states that in case the interruption of the broadcasting service is more than 30 (thirty) consecutive days, "except for reasons of unforeseeable circumstances duly proven and recognized by CONTEL, permission shall be revoked, without the licensee being entitled to any indemnity. " Now EBC has until December to reinstate the provision of the Shortwave service of Rádio Nacional da Amazônia, after authorization of the extension of the legal term granted by the Ministry of Science, Technology, Innovation and Communications (MCTIC). MCTIC also gave a period of 120 days for the reestablishment of the Medium Wave service for the return of the normal operation of Rádio Nacional AM of Brasília. North Korea conducted its sixth nuclear test on 3 September 2017, according to Japanese and South Korean officials. The Japanese Ministry of Foreign Affairs also concluded that North Korea conducted a nuclear test. The United States Geological Survey reported an earthquake of 6.3-magnitude not far from North Korea's Punggye-ri nuclear test site. 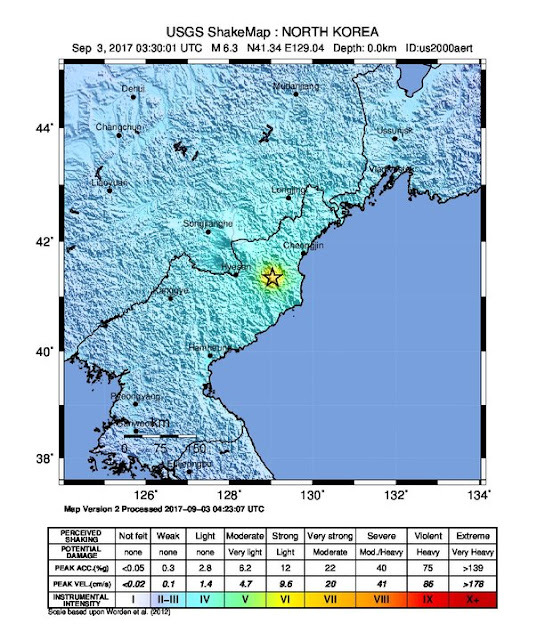 South Korean authorities said the earthquake seemed to be artificial, consistent with a nuclear test. The USGS, as well as China's earthquake administration, reported that the initial event was followed by a second, smaller, earthquake at the site, several minutes later, which was characterized as a collapse of the cavity. North Korea claimed that it detonated a hydrogen bomb that can be loaded onto an intercontinental ballistic missile (ICBM) with great destructive power. Photos of North Korean leader Kim Jong-un inspecting a device resembling a thermonuclear weapon warhead were released a few hours before the test. Meanwhile, China Radio International considered DPRK's nuclear test as worthy of only the number 3 spot in their list of headlines. Perhaps this shouldn't be surprising: some analysts have opined that Kim Jong Un had deliberately timed the nuclear test to coincide with Xi Jinping opening the annual BRICS summit in China as a show of defiance towards the Chinese leader. These are interesting times to be monitoring shortwave radio broadcasts, and in this case particularly so because North Korea uses the medium extensively to inform the world about its activities while investing relatively little into other methods of communication.